OUR PRICE: $50.95 - Join Rewards Get $5 Dance Dollars On This Item! 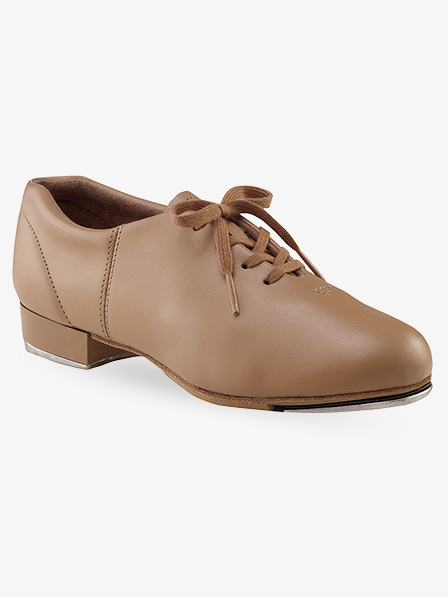 Capezio's "Fluid" tap shoe features a suede flexible outsole with light texon board shank for flexibility with support. Other features include a PU upper, Achilles notch, plastic heel, moisture absorbing microfiber lining, folded edges, and padded collar for comfort and Capezio TeleTone taps. Got for my daughter who is 12 yrs old, wears size 3.5 kids, per sizing chart order her a 5.5 and they fit perfect. She says they are comfortable (and she is picky about that) and the sound is decent. Only complaint is she wishes there was more flexibility, but pretty happy with the fit. Have had them 4 months, 2 lessons a week and practicing in between plus recitals and they look like new, no wear or tear. Expecting to last until she outgrows them. Will be ordering in black as well. Great value. If you have a narrow foot than I would recommend this shoe. I first ordered the regular width but it was too narrow for my bunions so I ordered the same shoe in a wide and I can wear it when my bunions aren't swollen. I like the soft leather that accommodates my old foot but I have ordered the Bloch Respect because my students say it is a wider toe. I got them today and notice they are wider but the leather is harder at the toe. I won't know until I teach a class whether they will be better for me. I do have a narrow heel. By the time I know whether they are going to work it will be too late to return them. After I have taught a class I will write a review on that shoe. I haven't had a pair of tap shoes on my feet for a long time. These are really good for the price. Very comfortable. Felt good to be tapping again. Shipping was very quick. This is a Third pair I order for my son through discountdance. None of them fit. My son 13yo wears size 9.5 street shoes. I followed the website guidance as well customer service "help" and ordered size 12 thinking it will be little big. It is way small. Just by measuring, it's 1 inch smaller than his old tap shoes which apparently are not for sale anymore. Also, they are for narrow feet. I ordered W. I can't imagine how narrow shoes would look because these look not wide at all. Not for male dancers for sure! The Capezio Tap Shoes arrived a day before my tap lesson. On first try they were a little tight and felt like a 1/2 size larger would have been more comfortable. Went online and researched the proper fit for Tap Shoes and the description fit the feel of the shoe. After the tap lesson my feet did not show any signs the the shoes were not the proper fit and there was no discomfort dancing in them. Completely satisfied with the purchase. This shoe ran a half size bigger than expected but is extremely comfortable, especially if you have huge dancer bunions like I do. I was disappointed with the durability of the synthetic material but time will tell. Comfort ultimately won out and I kept the show. I ordered these shoes after a few years away from tap. They do run small, so I would recommend ordering half a size up from street size. The rubber on the ball of the foot behind the tap is quite grippy, which interferes with some of my movements. I have danced for years, but I am new to tap so I wanted a mid-range shoe. After much research I chose this one and have been satisfied with it, I guess. However, after only three wearings in bare feet, the lining on the inside of one shoe is already coming unstitched; is pulling up from the bottom of the shoe and is bunching in the bottom of the shoe. Do these tap shoes run narrow? I have extra wide feet size 10. Should I get the 10.5 W,11 w? Capezio brand shoes tend to run narrow. If you have wide feet we would recommend purchasing the wide width. Are these shoes for men? Taking beginner adult tap lessons, I need to get my husband shoes! Hello! Thank you for contacting us. These shoes are unisex and can be worn by men. We recommend to order 2 sizes larger than the street size. Are these tap shoes split soul? These tap shoes are not split sole.